Basic safety rules should be followed when using the polishing/buffing machine. However, our cartoon character Ed the Handyman foolishly ignores health and safety. Read the safety rules outlined below and then work out which one of the cartoon characters below is working safely. 1. Always wear goggles - small pieces of mop and polish will fly out of the machine whilst it is being used. Goggles will prevent damage to eyes. 2. Always wear an apron or overall. These will hold back loose clothing. For example, a tie could easily be caught by the rotating mop, this would pull the machine operator into the polisher. This would result in a very dangerous and possibly fatal accident. 3. Always apply the work to the lower portion of the mop, never the top. 4. Never allow the top edge of the work to be caught by the mop. 5. Always be ready to use the foot stop (emergency stop button). Have your foot ready to press it if necessary. 6. 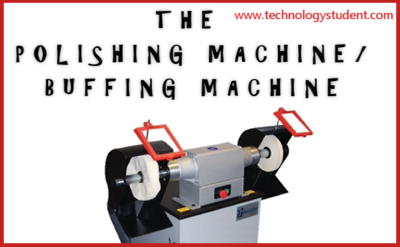 Although the buffing machine has two mops that rotate at the same time. The machine can only be operated by one person. 7. Read the general safety notes regarding safety in the workshop and follow these when using equipment and tools. 1. Look at the two drawings below. Explain, in detail, which diagram shows safe use of the buffing machine and which shows dangerous/reckless use of the machine.